NEW YORK, NEW YORK, USA, April 5, 2019 /EINPresswire.com/ — Political Intrigue! Shenanigans! VHRP LIVE! 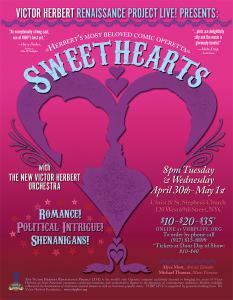 closes its Fifth Season with the classic 1913 operetta Sweethearts, on Tuesday April 30 and Wednesday May 1. Sweethearts is one of Victor Herbert’s most beloved comic operettas, in which a handsome prince is about to take a throne, a lost princess is found, and international politicians maneuver. “On Parade,” “Sweethearts,” “For Every Lover Must Meet His Fate,” “Jeannette and Her Little Wooden Shoes,” and “In the Convent They Never Taught Me That!” were all written when Herbert was at the top of his game, a household name and America’s most famous composer. The New Victor Herbert Orchestra (NVHO) supports the company at this final show of the season. This performance’s company features Claire Leyden, Jovani Demetrie, Joanie Brittingham, Sarah Caldwell Smith, Vira Slywotzky, Emily Geller, David Seatter, Drew Bolander, Matthew Wages, JoAnna Geffert, Jack Cotterell, Keith Broughton, Jonathan Hare, Jonathan Fluck, Caitlin Ruddy and Al-Jabril Muhammad. Advance tickets for each performance: $10-$35 tickets are available at vhrplive.org and tdf.org until noon on performance days. After 12 noon performance days, full price $10 to $40 tickets are for sale at the door at 7:30pm. Order by phone at (917) 815-8899. Please do not call the church for information. The Victor Herbert Renaissance Project LIVE! is the world's only company exclusively devoted to Victor Herbert, the Irish-born conductor and musician who composed innovative scores for early Broadway, as well as classical and popular music. VHRP LIVE! is a registered 501(c)(3) corporation founded in 2014 by the company’s Artistic Director Alyce Mott, a leading Herbert historian and librettist and Music Director Michael Thomas. In addition, VHRP LIVE! comprises a core group of classically trained singers who perform regularly in well regarded classical music venues in New York City, nationally and internationally. For more information please visit www.vhrplive.org. Next Next post: Motown and R&B Legends The Commodores Receive Honors From Two Alabama Cities!